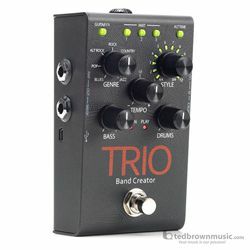 The TRIO provides seven music genres to choose from including: Blues, Pop, Alternative Rock, Rock, Country, R&B, and Jazz. Up to twelve song styles are available for each genre and you can select between 3/4 and 4/4 time signatures. The TRIO can learn up to 3 different song parts which can then be recalled on-the-fly as the song plays back. An optional DigiTech FS3X Footswitch can be connected to the TRIO for easier, hands-free selection of song parts and styles.